This month, join Intertops Casino travelling the Silk Road to China and you could win weekly bonuses up to $500! During the $150,000 Silk Road casino bonus event this month, 300 frequent players will win casino bonuses up to $500 each every Monday and one will win a $1000 cash prize at the end of the road. 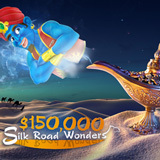 There's a magical genie leading players to $150,000 in prizes along Intertops' road to riches. You earn points whenever you play any of their many slots and table games from Realtime Gaming. Every Monday, they give away a total of $30,000 in casino bonus prizes. The more you've played, the more you can win. Even if you just play occasionally you still have a chance to win additional random draws on Thursdays for bonuses up to $150. Players earn points playing online casino games and mobile casino games and earn bonuses based on points. Intertops Casino offers hundreds of online casino games from RTG and adds more new games every month. It has just launched a new mobile casino with games from two major software providers, offering one of the biggest selections of mobile casino games to players anywhere in the world.